It's been five months since our last cruise. I'm having extreme symptoms of cruise withdrawal. We do have another planned but it's not until 2020. To make matters worse, I still have newsletters and messages showing up in my inbox tempting me and calling for me to explore various aspects of cruising. I should unsubscribe but I can't. I'm hooked--line and sinker hooked. 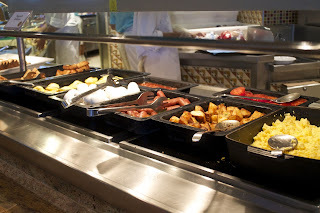 The latest posting I looked at was one from Cruise Critic telling me the eight things I should avoid on a cruise ship buffet. 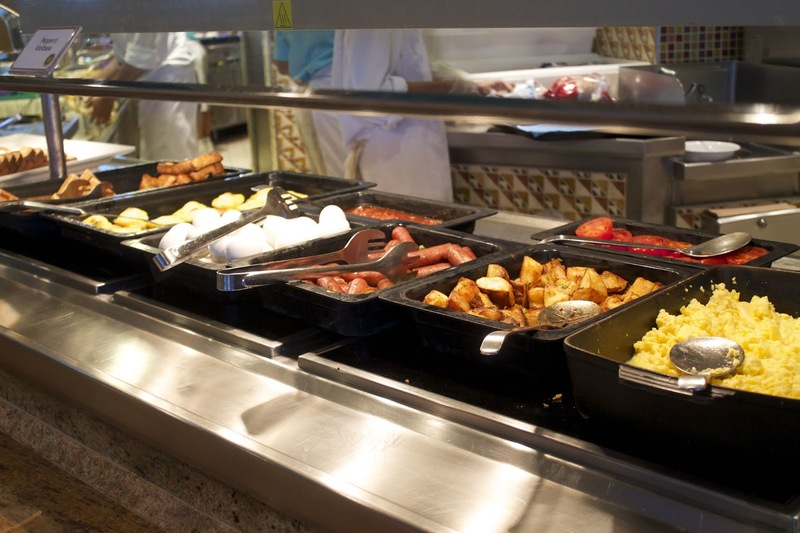 Actually, we usually avoid the buffet altogether on a cruises unless we are in a hurry because we have an excursion scheduled. I like to call it bumper plates--a crowd of people holding plates and trying to find their way around the food stations. While the article is interesting, it's also a bit frightening. Avoid the sushi it says. Well, probably not a bad idea at the buffet but don't avoid the Asian themed restaurants that make up the fresh sushi and if there is sushi at the buffet stick with the veggie sushi or watch to see how often they are replenishing. I've never really heard of anyone getting bad sushi. The ships really don't want any sick passengers. Some of the suggestions involve cleanliness and they make a good point. For instance if you are getting an ice cream cone from a self-serve soft-serve machine. you might want to use a napkin to turn the handle. After all, you're going to touch something that others have touched and then hold a cone in that hand to eat from. A suggestion not on their list is that after going through the line and serving yourself (if indeed that is what the ship allows you to do) then sanitize your hands one more time before eating. If you carry your own sanitizer, you can get the kind that's not so harsh on your hands although, a lot of ships are using a nicer, kinder sanitizer now. If you have good self-discipline or don't care about extra pounds for your time at sea, then by all means eat at the smorgasbord. Otherwise, eat in the dining room and make wise choices. Avoid the buffet blues when you step on the scale upon your return home.